Businesses are looking to share information quickly and securely from an all-one device that is simple to use, is economical, and does not take up much space. To address these business requirements, the Savin MP 402SPF, a low TCO, compact, and feature rich information is a hub that meets the needs of busy small to mid-sized businesses and workgroups. 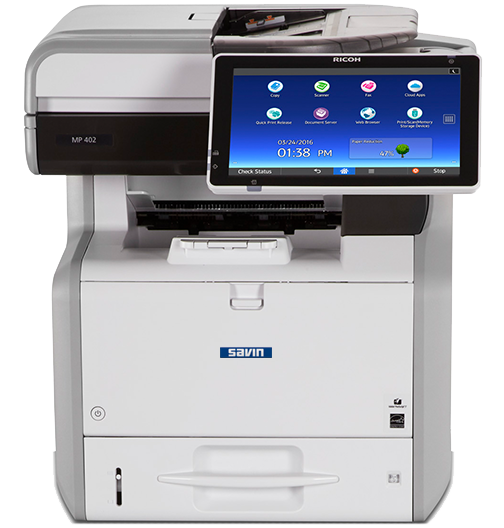 The MP 402SPF is a compact A4 B&W mid-volume MFP powerhouse that delivers a full print, copy, scan, fax, and document storage feature set at 42-ppm and is designed to support the needs of busy small to mid-size workgroups generating an average of 3,000-10,000 pages each month.